Today starts yet another nail art challenge! I am doing this one along with several other bloggers, so be sure to check out their links at the bottom as well. 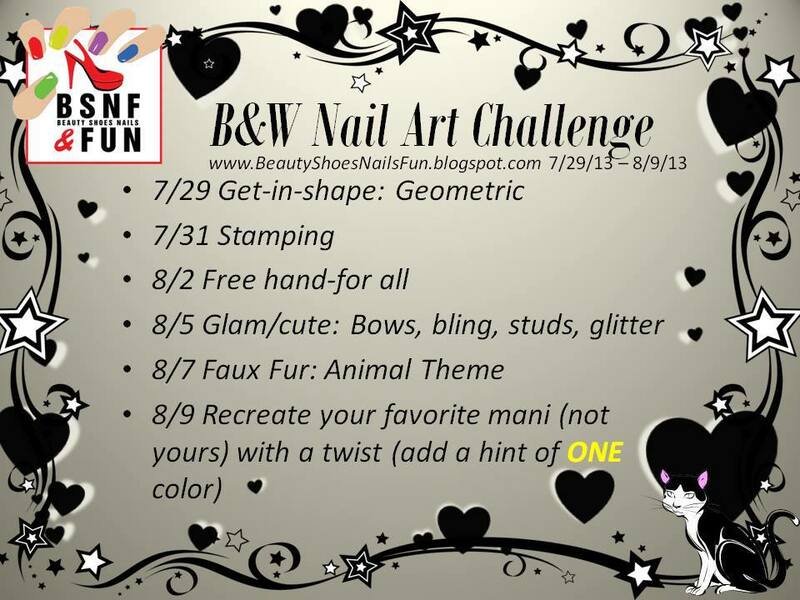 This challenge is all about black and white designs, so every theme will be done in only black and white polish! Today's theme starts out with the basics: geometric shapes. I suppose I did more of a geometric pattern than shapes, but I wasn't really sure what to do! Every idea I had sort of overlapped with a future theme in this challenge, so I decided to save my other ideas for later and just go ahead with this design. I love chevrons, though I didn't want to do normal chevron stripes across each nail. So instead I did them down each nail, and just left each side a solid color. I even ended up free handing the designs! I started off by painting each nail with China Glaze White on White. I then decided to try taping, but ended up failing at it. I waited a long time for White on White to dry, and even used a quick dry topcoat on it, but it still peeled up! I would have tried again, but I was a little busy yesterday and last night, so I didn't want to start over completely. Instead, I just decided to start free handing with Pure Ice Black Rage. I did the ring finger nail and thought it turned out perfect! So I went back and fixed the index and middle, which had gotten pulled up. I'm so happy with how the ring finger one turned out! It's almost perfect. Unfortunately the others didn't turn out as nice and clean looking, but they're close enough for me. It's funny how from one angle all of my nails look white, and from another angle they all look black now! Don't forget that this a multi-blogger challenge! So check out what everyone else did for today's theme. As usual, anybody is welcome to join in though. Feel free to add your link with InLinkz belows or share your photo on my Facebook wall! I am so excited to share today's polishes! As you all know, I love Zoya, and I'm crazy about their PixieDust polishes. They're textured polishes, but they're also very sparkly so you can appreciate them with a glossy topcoat if a matte textured finish isn't always your thing. Dhara is a wonderful, warm orange. With the gold textured bits, it makes me think of pumpkin spice - perfect for fall! 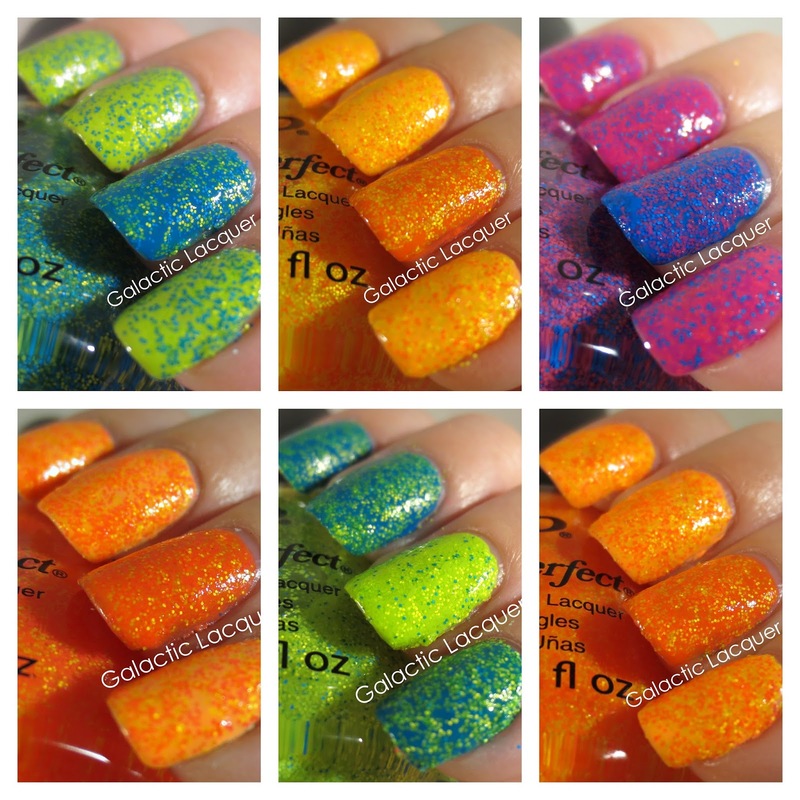 It's a little on the bright side, but isn't as bright as Zoya Beatrix from the summer PixieDust collection. I used two coats of Dhara and no topcoat. It's somewhat of an orange jelly, though it covers very well in just two coats. Tomoko is a super sparkly silvery champagne. I think this one is the most dazzling out of the collection, as it really catches the light. It's such a slight champagne color that it's pretty much silver to me, though it does have that yellowish-gold tint to it. It's at least much more silvery looking than Zoya Godiva, which is more of a beige PixieDust. For being so light, it covered very well. I used two coats of Tomoko with no topcoat and got full coverage. Carter is one of my favorites from this collection. It is a deep, regal purple shade that is really stunning. I think the glitter contrasts with the base in Carter a little more than some of the other shades in this set. The base is a blue-violet jelly and the fine glitter is more of a bright purple, so you really get some depth to it instead of it just being a deep purple allover. I used two coats of Carter with no topcoat. I am stunned by how beautiful this one is, and I'm not even a huge fan of purple! Arabella is a raspberry sort of color. Since it's pretty much a jelly like a lot of the other PixieDust polishes, it looks a tad lighter on the nail than it does in the bottle. Also, this one didn't seem to try as matte as the others, which also would have helped to lighten it. Still, it's a gorgeous shade. Zoya describes it as a "rich fuchsia pink," but I like to think of it as more of a raspberry or cranberry, which is also perfect for fall! I think it is much brighter, more opaque, and more bold than Zoya Miranda though. I used two coats of Arabella with no topcoat. Sunshine is an interesting shade. I also think the name is pretty funny since it's such a dark color! I would describe Sunshine as a denim blue. With the silver sparkles and matte finish, it almost looks like denim texture too! I really love the shade though. It isn't as bright as Zoya Liberty, but isn't as subdued or pale as Zoya Nyx either. Also, this is one coat of Sunshine. It is much more opaque than the others since it isn't a jelly base like the others. Chita is another one of my favorites from this collection. It is a deep forest green with lots of sparkle. The texture really stands out in this one to me visually. I'm also really happy that they made another green PixieDust! The only other one is Zoya Vespa which is much lighter. Chita is also another one coater. I applied one generous coat of Chita with no topcoat. I am absolutely in love with this collection! 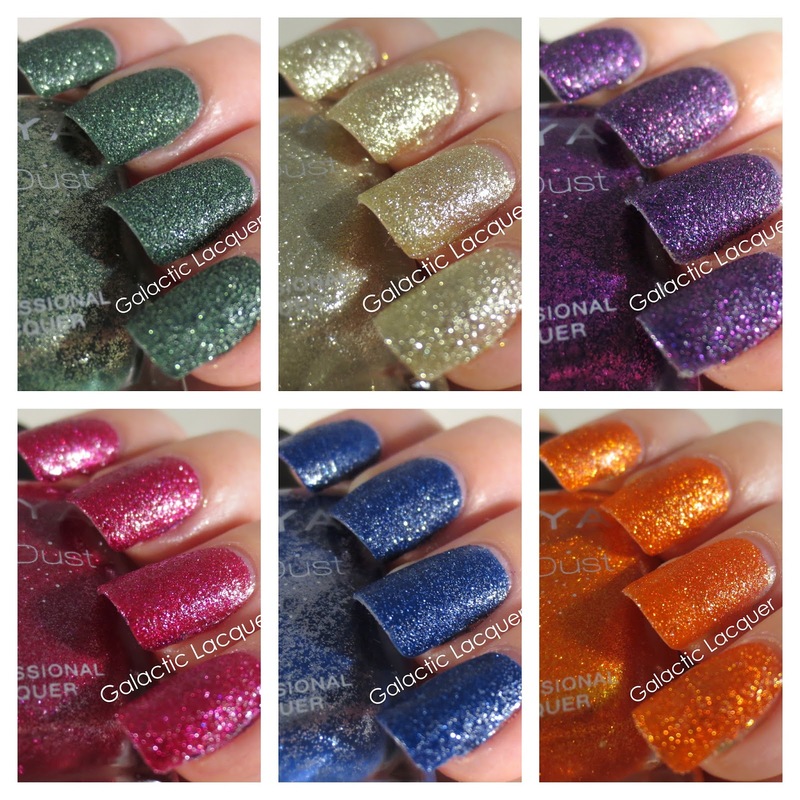 I think these are my favorite PixieDusts so far, and I hope Zoya continues to make more PixieDust collections. I would love to see a winter collection! As for application, all of them are super easy to apply. They seem a little thick, but they're still super manageable. They also all cover very well, and either take one or two coats for full coverage. I didn't show them with topcoat this time, but from prior experience, I'm sure they'd be gorgeous with a glossy finish! You can appreciate the sparkle with matte or glossy with the PixieDust polishes. I'm not sure what these polishes are really called, but I've been calling them Summer Floam polishes, after the legendary Nailventurous Floam polish. One in this collection is very similar to Floam, and the others are just as exciting! They're all pretty much the same thing, just different colors. They're all a clear base filled with tiny, colorful glitters. There are six that I found at Walmart, so I grabbed them all! Kaboom, Zapped, Bang, Joly, Exploded, and Shocked. Shocked is a bunch of hot pink and bright blue glitter together. From afar, it looks more purple since the colors mingle together so closely. I decided to paint it over Essie The Girls are Out and China Glaze Hanging in the Balance since they're both similar to the glitter colors. The blue contrasts like crazy, and you can see how it really pops. I used two coats of Shocked. Bang is filled with orange and yellow glitters. This one looks very similar to Jolt and Exploded, but Bang is pretty much in the middle - Jolt leans more yellow and Exploded leans more orange. I applied it over China Glaze Sun of a Peach and Essie Sunday Funday. I only used two coats of Bang, but it looks a little thick since unfortunately Sun of a Peach took a few coats to become fully opaque. Bang covered well, though I had a problem with some of the glitters getting messy since mine had a slightly messed up brush. 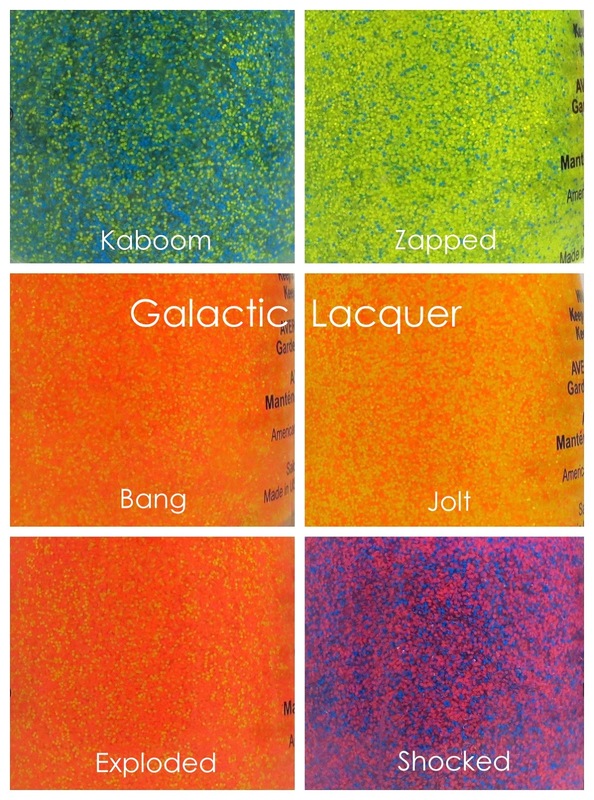 Jolt is a lot like Bang, but it has much more yellow glitter. I applied it over China Glaze Sun of a Peach and Essie Sunday Funday again. I think I like how Jolt looks over these colors more since it's more yellow, and therefore it shows up a little better over the orange polishes I chose. I used two coats of Jolt. Zapped is sort of like inverted Floam. It has a lot more yellow-green glitter than blue glitter, and is actually similar to Ninja Polish's Sunny Floam. I applied it over China Glaze Hanging in the Balance and Essie The More the Merrier. I like how it appears over both colors, though you can see how the blue glitters camouflage with the blue polish and the greenish-yellow glitter with the green polish. Also, you can see how it's all over my fingers. The little glitters can get messy! If you get some on your skin and want to clean up around the nail, it may be a little difficult to get all the little bits of glitter. Kaboom is like an inverted Zapped. There are more blue glitters than greenish glitters, though it may actually be half-half. I applied it over China Glaze Hanging in the Balance and Essie The More the Merrier again, though I switched the colors - this time the accent nail is blue instead of green. While a lot of the glitter pieces hide in the polish colors I chose, I like how well they match. I used two coats of Kaboom. Exploded is similar to Jolt and Bang, though it's much more orange. Almost the entire bottle is orange glitter with a little bit of yellow glitter. The orange pieces almost appear to be a little on the coral side too. This one is a little too orange for me, and I think I prefer Bang out of the three since it's right in between orange and yellow. I once again applied it over China Glaze Sun of a Peach and Essie Sunday Funday so it would be easier to compare how they all look. I used two coats of Exploded. In general, I'm pretty pleased with these polishes. They were really difficult for me to find in my local Walmarts, and since they seem to be a summer item, I'm not sure how long they'll be around. But I would recommend that you grab some if you spot them! I only really had some difficulty with them being a little on the messy side, but that's also because I was swatching them one after another and also had one that had a wonky brush inside. Try to be pretty precise with them - if you want to clean up the little glitters from your skin, it'll be hard to do! They stick to skin a lot, but eventually come off after washing your hands a few times. I've been meaning to share these products with you all for a while now! 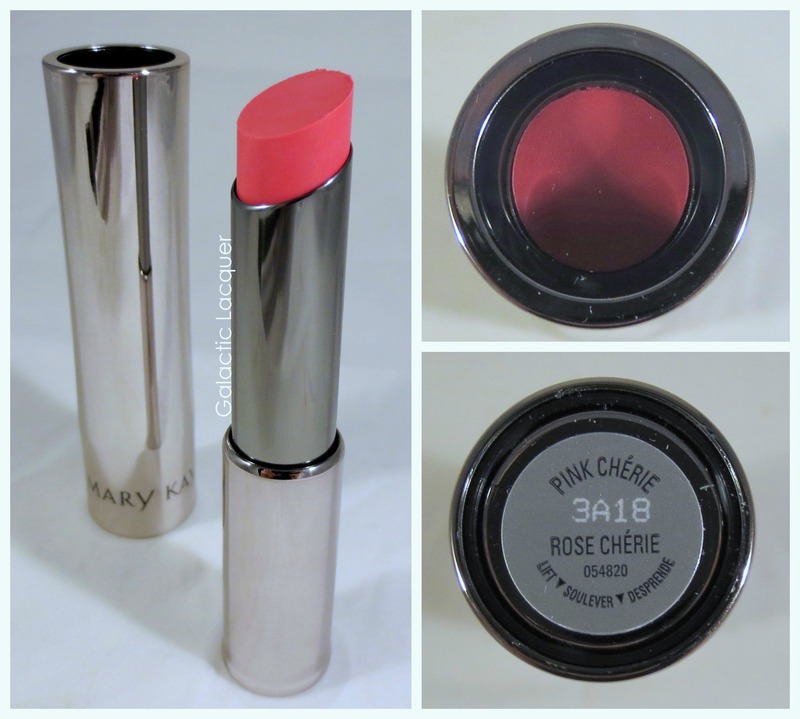 I received from wonderful Mary Kay cosmetics, courtesy of Influenster. I've been giving them quite some good use so I could develop a better opinion of them. The lash primer is something that I was pretty excited to try out since I haven't used primer on my lashes before. The tube is quite large, and is pretty much the same size as a full sized mascara tube. 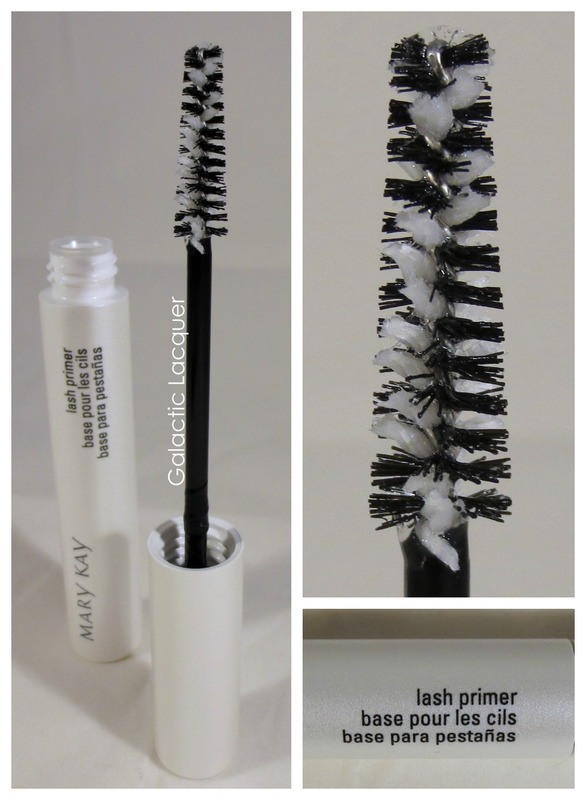 The brush inside is unique since it's both black and white, and has two different kinds of bristles mixed together to really grab your lashes. I applied the lash primer before the Lash Love mascara, and it seemed to make my eyelashes more plump and made the mascara adhere more easily. Since the primer is clear, it also doubles as a nice brow gel too! While it made my lashes a little more plump, I probably wouldn't use this product constantly though. I received this mascara at a good time since I was running out of my Urban Decay one and wanted to try something new! This is a full size tube, so it's quite long. The brush inside is slightly curved, which I like since it helps contour to the lashes better and helps reach into the corners more easily. The bristles are plasticy, and while they are tiny there are lots of them. I applied this mascara with and without the primer, and I love it either way, though I think I prefer it on its own. The brush is amazing at preventing clumps, and is somewhat comparable to the Covergirl Clump Crusher mascara. I only got very tiny clumps, which were barely noticeable, and they were pretty much my fault since I got them when applying mascara in a hurry. 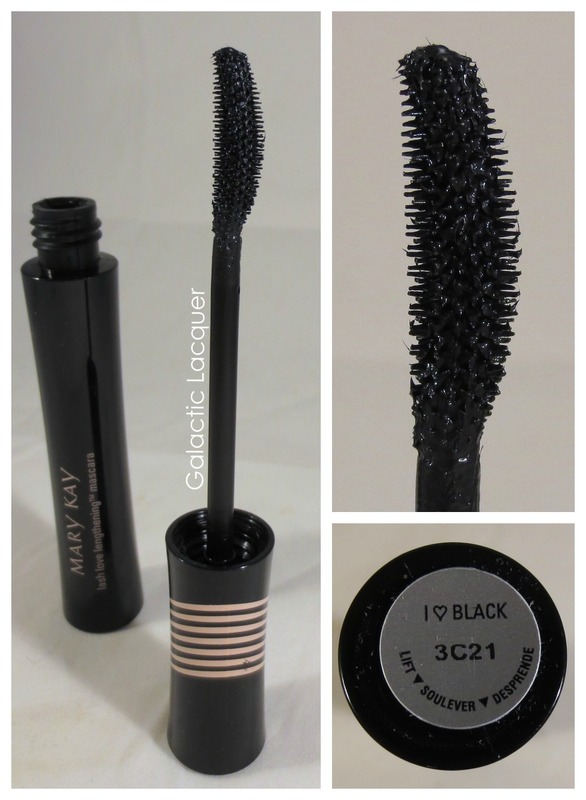 With this brush, I don't ever have to comb through my lashes to get clumps out! I love it. I'm not a huge fan of purple, so I was skeptical of this eyeshadow at first. I also tend to use pressed eyeshadows on top of primer, so using a cream eyeshadow was also a little out of my norm. However, it turned out to be great! The purple is pretty light, or at least it looks much lighter once its on skin. I'm surprised, since I figured it would look pretty dark against my pale complexion. It's shimmery, so I think that helps it look lighter and more like silver. It's a nice color though, and it's very wearable. It's way more subtle on my eyelids than I thought it would be, and it works perfectly with the Lash Love mascara and the True Dimensions lipstick. In the photo above, I did a quick swipe on the right, and a few swipes on the left. It builds up easily and it doesn't feel thick and gloopy. It also lasted all day at work without a lot of fading or creasing - the wear was very minimal. I applied the Cream Eye Color with this brush. The brush is actually really soft, yet the bristles maintain their shape well and don't shed. The handle seems a little on the short side to me compared to some of my full size brushes, but it's still larger than most travel size brushes. I didn't use it for concealer, but I would imagine this brush would be perfect for it as well. It applied the Cream Eye Color effortlessly, and it was easy to control where the color went and get right up in the crease. I've been addicted to lip products, so I was also excited for this lipstick. It looks brighter in the container, but it isn't as obvious when it's swatched or on your lips. The color is Pink Cherie, and it's a beautiful shade of pink that I find very versatile. It shows up well but isn't too bold. I think it's great for either day or nighttime use. I swatched it on my hand quickly below. On the right, I did one quick swipe, and on the left, I went over it a few times. 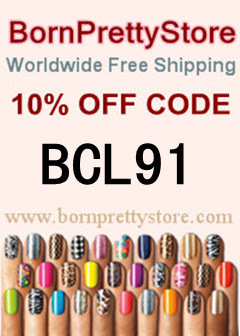 The lipstick is very soft and applied easily, but don't apply too much pressure! Since it's on the soft side, gently run it across your lips and it'll look great. If you apply it too heavily, too much gets on and then clumps in the corners of the mouth. In general, I was very impressed with these products. I haven't bought any Mary Kay products in a long time, so it was nice to see what they're currently making. I think my favorite item is the Lash Love mascara - no clumps! I also really like the Cream Eye Color/Concealer Brush since it's so versatile. While today wrapped up the Comic-Con Geek Week nail art challenge, it is also a day of remembrance. 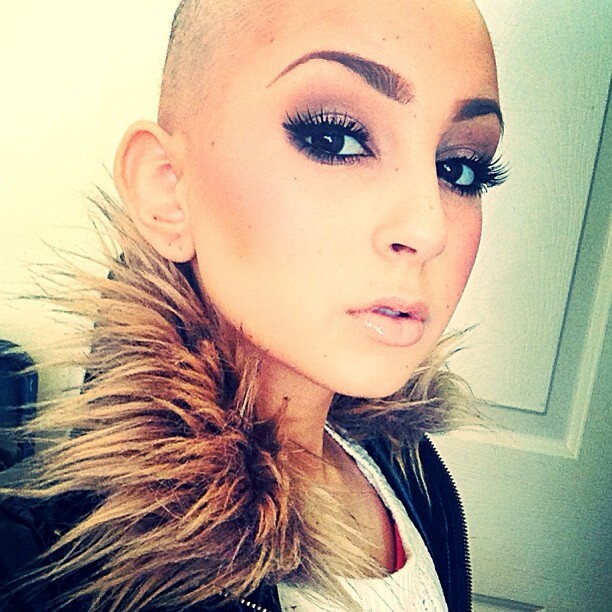 Today, hundreds, if not thousands of bloggers and fans around the world are showing their love for Talia Joy. If you were not aware, Talia Joy was a beautiful little girl who was battling cancer. She was a wonderful makeup guru and adorable YouTube personality. She even appeared on Ellen and was an honorary Covergirl. She will be dearly missed by myself and millions of others who had their hearts touched by her or were inspired by her and her strength. One of the last photos Talia put up on her Instagram was the one above. The caption said "Nail day with momma," and depicts her and her mother's hands with a mint nail polish on. While I don't own the same mint polish, I wanted to honor Talia along with other bloggers and fans with a mint manicure. This is one of my favorite mint polishes, so I thought it would be perfect for today. I used China Glaze Keep Calm, Paint On and decided to dress it up with some studs to make it even more beautiful and interesting like Talia. I applied two coats of Keep Calm, Paint On to each nail. While the second coat was wet, I placed the studs right into the paint. I placed one large silver circular stud on each nail along with two smaller ones. The small ones are 1mm in diameter and the larger ones are 2mm. I think this manicure is simple and elegant, and mint just happened to be a wonderful color for today and for remembering Talia. To be honest, I will probably think of her whenever I use this polish now. I cannot express how sad I am for Talia's family and how upset it makes me just knowing what this girl had gone through. I have watched family members including my own mother battle with cancer, and it pains me to see anybody go through that struggle. I express my sincere condolences for Talia's friends and family in this difficult time. She was taken way too soon and will be dearly missed, but the inspiration from her time here will live on.